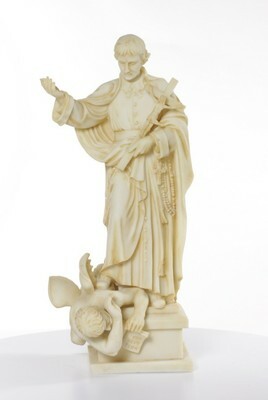 Cast resin statue of St. Louis de Montfort, created sometime between 2001 and 2010 in China. St. Louis de Montfort stands on top of a devil figure who seems to be trying to destroy the book, True Devotion, a text written by Montfort that had been lost. Montfort holds a crucfix, and a rosary is attached to his belt. Montfort was known as an itinerate preacher.